The Esri Production Mapping extension streamlines your GIS data and map production by providing tools that facilitate data creation, maintenance, and validation, as well as tools for producing high-quality cartographic products. Production Mapping provides tools for managing your production from beginning to end. Each organization has workflows that are unique to the type of data being collected and the type of product being delivered. 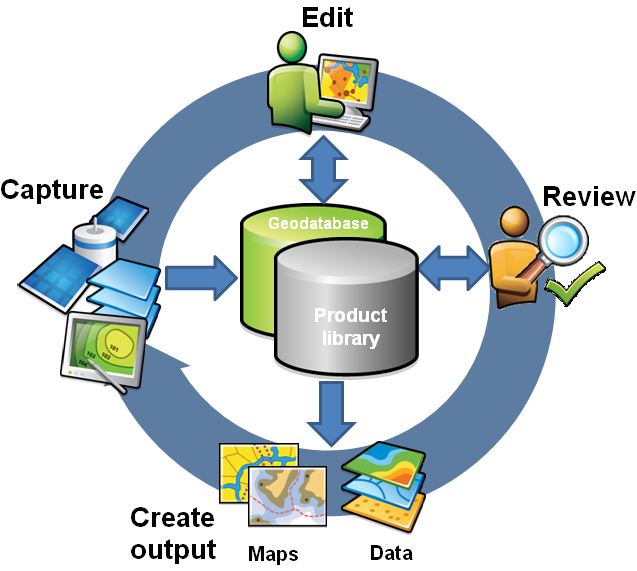 These workflows can be generalized into a basic production workflow that consists of steps to create your geodatabase and capture or load an initial set of data, perform edits to the data, ensure the data is valid and accurate, and produce digital or hard-copy output. Production Mapping is designed to streamline each of these steps while remaining flexible to adapt to your business rules and workflows. The Esri Mapping and Charting solutions include industry-specific, standards-based templates, rules, and tools. Through configuration, the tools and processes can be adapted to meet maturing business needs, and therefore an API is not included for customization. Central to any production workflow is the geodatabase. How you choose to design your geodatabase determines what data needs to be captured and edited, what logical rules exist for validating the data, and the types of output that can be created. When designing a geodatabase, certain types of validation are built in, such as the ability to limit the valid attribute values for a field by using a domain. You can also model the geometric relationships of features through topologies or networks. Production Mapping supports these forms of validation and allows you to define additional business rules using ArcGIS Data Reviewer for Desktop checks stored in a batch job. The batch jobs can be run when you update the attributes of a feature or template, like domains, or as a postprocess, like validating the topology. The product library in Production Mapping provides a framework for managing business rules, data, and map documents in a secure, centralized location. By leveraging the rules stored in the product library, data editing tools are tailored to ensure that features conform to your data collection standards. During cartographic production, the product library can act as a document management system for your map documents and data, allowing you to check files in and out and restore historical versions. The cartographic tools in Production Mapping can also be used to ensure consistent and repeatable symbology as well as provide a number of dynamic surround elements. The purpose of data capture is to consume existing data or create new data in your geodatabase. Data can be captured many different ways such as extracting new data from imagery, gathering information in the field with a mobile device, or converting existing data into the geodatabase. Feature Manager allows you to quickly and easily create new features by using feature templates and construction tools within a centralized editing environment that leverages your enhanced validation rules and provides a new type of feature template called the composite template. Production Mapping also provides the data load automation tools, which allow you to define the mapping between source data, such as shapefiles or coverages, and your geodatabase ahead of time to ensure consistency when converting large amounts of data. The editing stage of the production workflow involves adjusting existing features and adding new features to ensure that your data is up-to-date and accurate. This can involve updating data to match a new source or modifying attributes of data that was collected for a different purpose. When editing data within Production Mapping, feature attribution is managed through the Feature Manager, which allows you to update fields while ensuring the attributes are valid according to your validation rules as well as batch update attributes and create new features. Production Mapping also provides a number of editing tools for batch geometry updates as well as tools for specific types of data or industries, including tools for linear referencing, utilities, contour lines, and z-enabled data. Data review is important to ensure that the data being created is accurate and fit for its intended purpose before the data is delivered or used for making a map product. The data review or quality control stage of the production workflow often involves three phases: finding issues with the data, whether through manual or automated methods; fixing issues or marking them as exceptions; and verifying that the issue is resolved. The Data Reviewer component of Production Mapping provides the ability to track records of all issues you find in the Reviewer table, which maintains the status of the record as well as a link between the record and the feature with the issue. Data Reviewer offers the ability to automate data validation through configurable checks that can be run when you choose, scheduled through a Windows service to run at specified times, or run through Python scripts. Automated checks may not be able to find all problems with the data, such as missing features. Data Reviewer also has a number of tools to help with manual or visual quality control including tools to flag missing features and the ability to create a sample set of data for in-depth validation. Data Reviewer is available with Production Mapping or as a stand-alone extension. Typically, the final stage of a production workflow is to create the output that will be delivered; however, the workflow may repeat if making a delivery contingent on approval or creating a product that requires regular updates. There are many types of output that may be produced: data exported to a certain format, hard-copy maps, or data that will be served over the web. When producing hard-copy products, there is wide range of types of maps or charts that you may need to produce, from one-off maps to map books to highly detailed charts that require version tracking. Production Mapping provides support for hard-copy map production through the product library by providing check-in and checkout capabilities for map documents as well as the ability to track history and roll back to previous versions. Data visualization and symbology is important when producing a hard-copy product or serving data over the web. Production Mapping provides the views and visual specification tools for consistent, repeatable, rule-based symbology, where you define what symbol or representation should be applied to features based on their attribute combination. Production Mapping also provides a number of custom surround elements, such as the graphic table element, that allow you to create a table or legend that automatically updates based on the data being displayed. When managing production, it is important to be able to allocate resources and track the status of the project. Being able to ensure that work is being done consistently and that steps are not being skipped is also essential. Production Mapping allows you to tie all the components of data capture, editing, validation, and cartography together in high-level workflows with ArcGIS Workflow Manager for Desktop and in detailed workflows with Task Assistant Manager. Workflow Manager is available in the Production Mapping media kit and as its own stand-alone extension. Workflow Manager allows you to create a job (unit of work), assign or reassign the job to a user, and track the overall status of the project. Each job includes a predefined workflow that you build to represent your processes. When assigned a job, you execute the steps in the workflow to launch the appropriate tools, send email notifications, or ask questions to determine the path the job should take. Task Assistant Manager allows you to define workflows in ArcMap that guide your users through various tasks. Task assistant workflows can be used to provide step-by-step instructions for complex tasks, minimize confusion for new users, or merely used as a reference. Clicking a task in a workflow can execute a tool in ArcMap or geoprocessing tools, set up your environment by setting layer or snapping properties, or provide a description of what needs to be done. Esri provides three out-of-the-box solutions for the defense mapping, nautical, and aeronautical industries that are all built to utilize and expand on Production Mappingfunctionality. Production Mapping content is also available on the Esri Resource Centers for many of the user communities. Production Mapping can be used to build your own solutions by creating a product library to meet the standards of an industry or business.